Whether your heating or air conditioning system is brand-new or has been in your home or business since it was built, the experts at Tustin Plumbing, Heating & Air Conditioning know how to repair and maintain it. 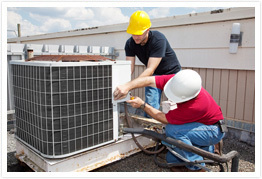 Our highly trained technicians can provide high-quality, cost-effective repairs on all makes and models of HVAC systems. For over 50 years, Tustin Plumbing, Heating & Air Conditioning has been providing expert repairs, maintenance and installation services to families and businesses throughout Orange County. Call today, and let us provide you top-quality service on whatever make or model heating, air conditioning or water heating system you have.